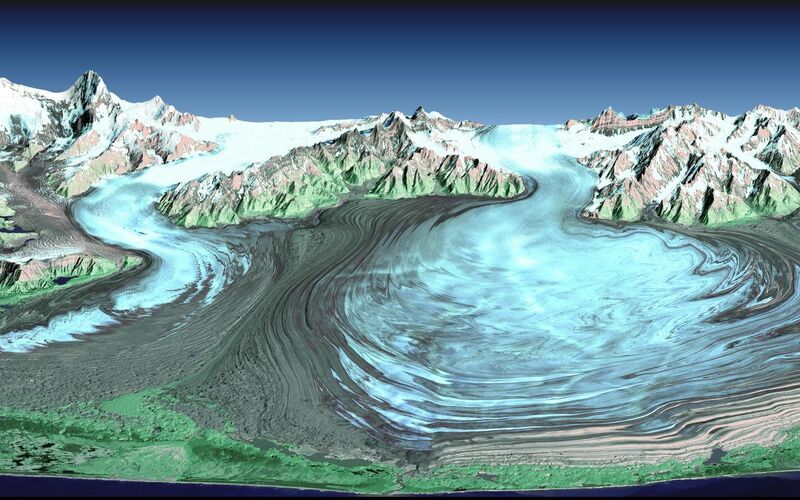 Malaspina Glacier in southeastern Alaska is considered the classic example of a piedmont glacier. 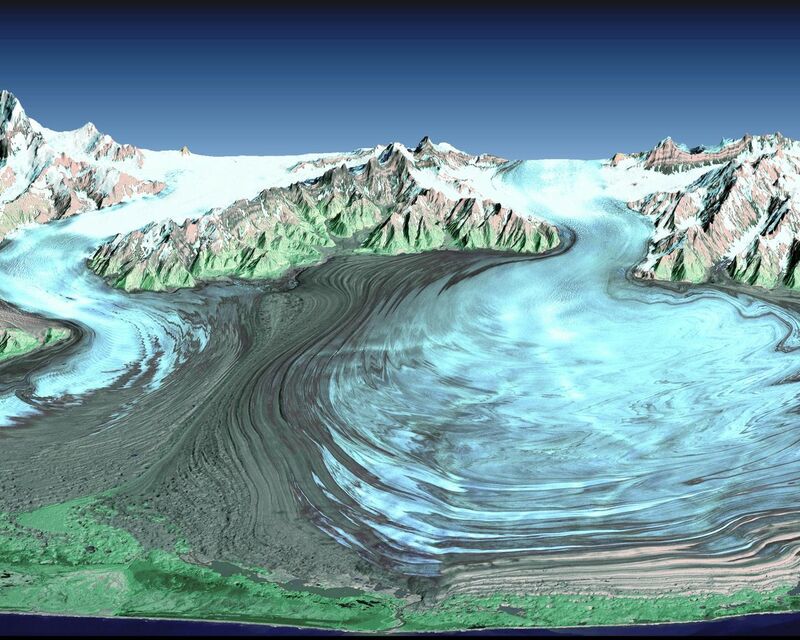 Piedmont glaciers occur where valley glaciers exit a mountain range onto broad lowlands, are no longer laterally confined, and spread to become wide lobes. 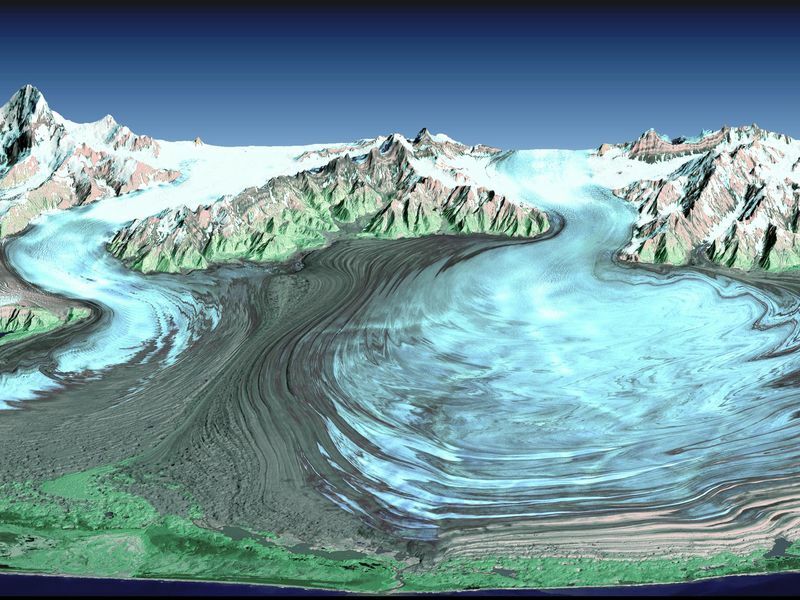 Malaspina Glacier is actually a compound glacier, formed by the merger of several valley glaciers, the most prominent of which seen here are Agassiz Glacier (left) and Seward Glacier (right). In total, Malaspina Glacier is up to 65 kilometers (40 miles) wide and extends up to 45 kilometers (28 miles) from the mountain front nearly to the sea. This perspective view was created from a Landsat satellite image and an elevation model generated by the Shuttle Radar Topography Mission (SRTM). Landsat views both visible and infrared light, which have been combined here into a color composite that generally shows glacial ice in light blue, snow in white, vegetation in green, bare rock in grays and tans, and the ocean (foreground) in dark blue. The back (northern) edge of the data set forms a false horizon that meets a false sky. Glaciers erode rocks, carry them down slope, and deposit them at the edge of the melting ice, typically in elongated piles called moraines. The moraine patterns at Malaspina Glacier are quite spectacular in that they have huge contortions that result from the glacier crinkling as it gets pushed from behind by the faster-moving valley glaciers. Glaciers are sensitive indicators of climatic change. They can grow and thicken with increasing snowfall and/or decreased melting. Conversely, they can retreat and thin if snowfall decreases and/or atmospheric temperatures rise and cause increased melting. 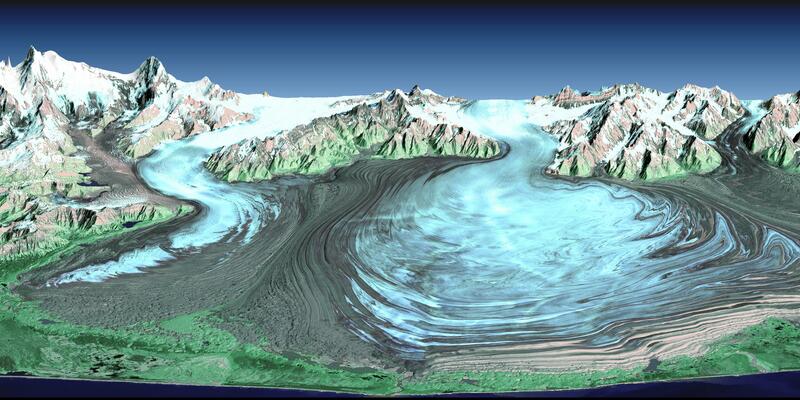 Landsat imaging has been an excellent tool for mapping the changing geographic extent of glaciers since 1972. The elevation measurements taken by SRTM in February 2000 now provide a near-global baseline against which future non-polar region glacial thinning or thickening can be assessed. Elevation data used in this image were acquired by the Shuttle Radar Topography Mission aboard the Space Shuttle Endeavour, launched on February 11, 2000. The mission used the same radar instrument that comprised the Spaceborne Imaging Radar-C/X-Band Synthetic Aperture Radar that flew twice on the Space Shuttle Endeavour in 1994. The Shuttle Radar Topography Mission was designed to collect three-dimensional measurements of the Earth's surface. To collect the 3-D data, engineers added a 60-meter-long (200-foot) mast, installed additional C-band and X-band antennas, and improved tracking and navigation devices. The mission is a cooperative project between NASA, the National Imagery and Mapping Agency of the U.S. Department of Defense, and the German and Italian space agencies. It is managed by NASA's Jet Propulsion Laboratory, Pasadena, CA, for NASA's Earth Science Enterprise, Washington, DC.